I could possibly retitle this, as this was not pictures of her hooves before consuming 1oz quantities of alcohol and, I assure you, they would look no different after whiskey was consumed. I wanted to write a short blog on her feet before I trimmed them (after shots will follow, don't worry) just to share. 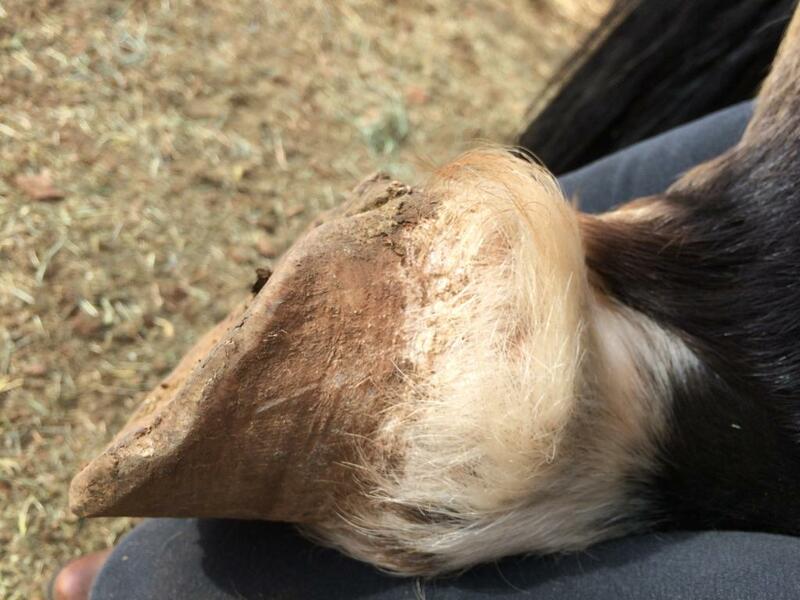 I think some people out there (probably not the majority, but some for sure) have the concept in mind that a barefoot horse, trimmed with a "Mustang Roll" will have Mustang hooves, just by the mere fact of being barefoot and ambulatory. There was a study done using 12 different horse bands in Australia and they tracked what their hooves looked like. 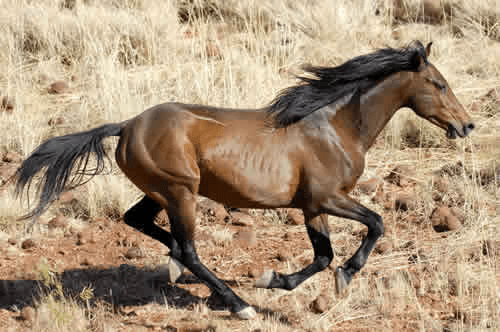 They were all Brumbies (Australian wild horses, "mustangs" if you will) and all had been wild and loose and breeding and naturally evolving for at least 200 years. They should all have "mustang hooves" right? My summary on the study was this: all 12 bands of horses tracked had DIFFERENT hooves. They had hooves that wore in relation to their environment, not their genetics. Soft ground led to Brumbies with long crumbling walls and folded over bars. Harder ground led to shorter hooves that flaked and chipped. 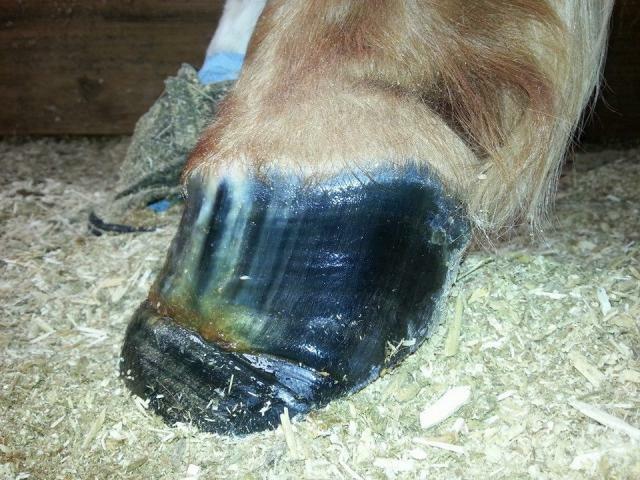 Over 90% of the horses tracked all had signs of laminitis. Some from too lush a diet, some from too hard-packed ground (road founder). Some had contracted heels. Enter Stella: Stella had very long hooves with shoes falling off when she arrived. They were shoeing her flare, not her actual hoof. As such, she has a wiggly staircase of old growth and I love watching the "rings" of her tree grow down and out. By Spring she will have a new hoof capsule and we'll see where our actions have taken us. Let's look at the hooves of a horse on moderately soft ground. What do you think happened to them? FRONT LEFT to start with. I can knife out the dead, flakey, powdery sole and then nip/rasp the hoof wall to being just slightly longer than the plane of the sole. I can leave the sole alone and trim the walls down to just below the solar plane and leave it. My understanding is, if the flakey stuff is so loose that a hoof pick can piece it out, then a 1,000 lb horse should be able to exfoliate it on their own. Why isn't it? It's not touching the ground or not touching rough enough ground to abrase it and have it fall out. If I lower that hoof wall enough, I will get the false (dead surface) sole to fall out. After which, I likely have the wall longer than the solar plane, but I will have to go back and check that it is short enough, as a lot of sole might come out. Here is the FRONT LEFT from the side. I like how tight and vertical the new growth coming in is. The lower the hoof you go, the further into the past you are looking. You wouldn't steer the Titanic by looking at the wake off the back of the ship, similarly, you don't look at the "end" of the hoof to judge how you are going to trim it: you look to the new growth. If you like what you see, you don't change course. 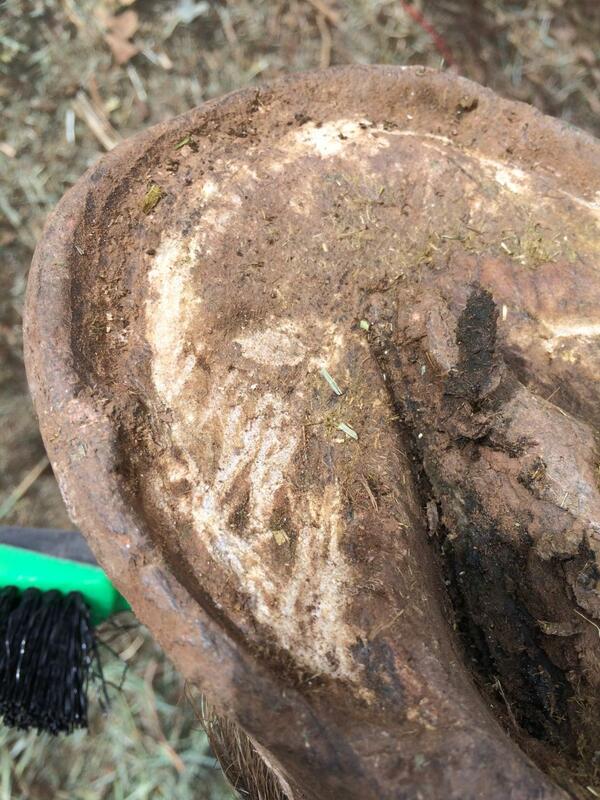 Now, the sole can sometimes look scary and "wrong" but you are dealing with history and old hoof wall growth coming down from the coronet band. Don't change course of the ship to make the bottom of the hoof look pretty. 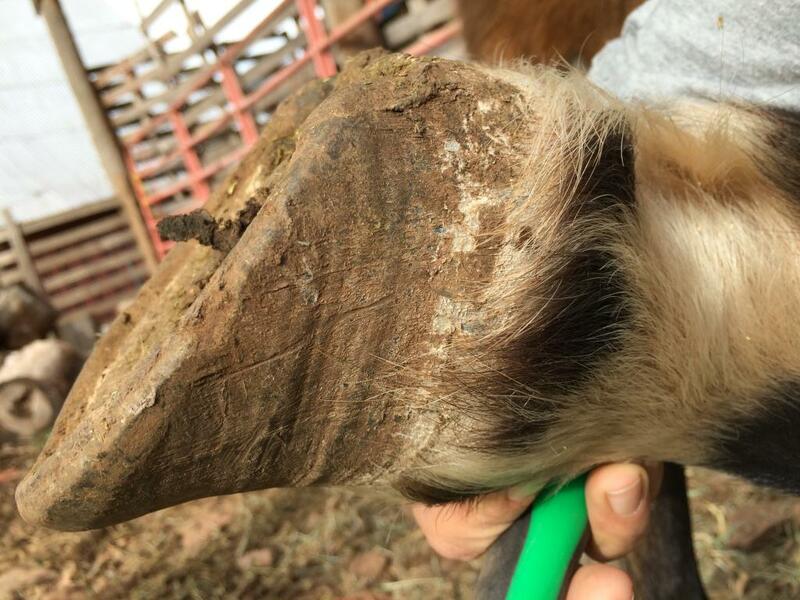 Adjust the bottom of the hoof to make the new growth happy. She was shod and very long in the hoof. I have been tempted to hack her hoof off, level it off and dig that sole out. I might make her lame, I might not. I am not a professional farrier. I'm taking the cautious amount off. This blog is purely my "reading" her hoof, and gives me the view of what I like/don't like and what I see is happening and what needs to come off. What I see in her is huge heel growth. Seeing her "live" and in the flesh (I know you can't see everything I see just by getting two pictures of a hoof) I see her with flared toes. Hoof wall at the toe that is "un velcro ing" from the sole and pulling forward. She's growing heel long and more forward, trying to give herself support. Not only do I not want her heels growing forward, I want to get those long toes taken care of to relieve that velcro pulling that she's telling me is happening. This shot captures nicely how tight her new growth is coming in, how tall her heels are spurting in and the ridges down her hoof wall from all prior growth. If you visualized the new growth moving down like a conveyor belt, you can quickly see how far out of the growth pattern the toe has gone. 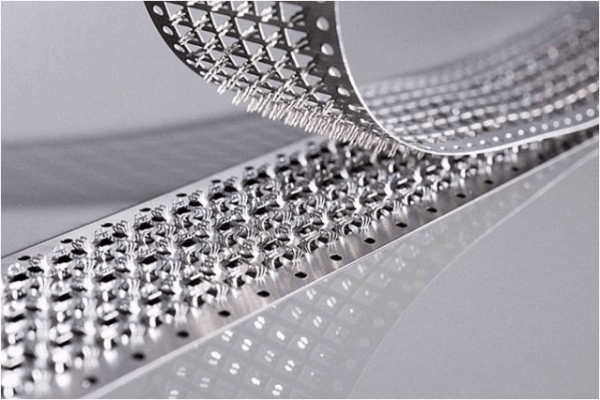 It's flared quite a bit and is less and less supportive, less and less connected tightly in the laminae. Lots of stretching. You can see the rings of her hoof waver as it pulls around the heel. That heel is growing in at a mad rate, ha ha. You can almost see a triangle effect of lots of growth in the back, compared to very contracted growth in the dorsal (front) of her hoof wall. This was a second screaming clue that she doesn't "want" her toe length, as she's not resupplying the toe area with fast growth. She thinks her toes are long and odd enough, thank you. She is trying to grow heel to offset that long toe and move the heel under her to give better support and relieve the toe. I had blogged about the hoof as a support column for the pillar of the leg. When both pillars take the weight, the hoof is happy and balanced. 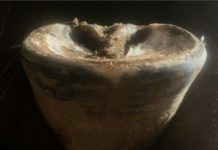 When one pillar is compromised (in this case, a long toe) the back pillar (heel) moves forward to take on the weight as a single column, like you can see in the chestnut's hoof there. This isn't surprising to me, as she had long hooves and is growing out "history". I just need to look at her new growth and make sure the "front of the ship" is moving in the right direction. Again, don't steer by the stern. Read the stern for history, read the hoof from the past to the present (from the sole to the coronet band). Learn from it. See what decisions the horse is making about his hoof. He too is feeling the "past" on the ground and adjusting his "future" by the new growth. If you don't adjust the ground (sole level of the hoof) correctly, the horse will start to adjust. You'll see it in the new growth. Don't like how the new growth is coming in? Then what you left on the ground, the horse is compensating for and it needs adjusting. 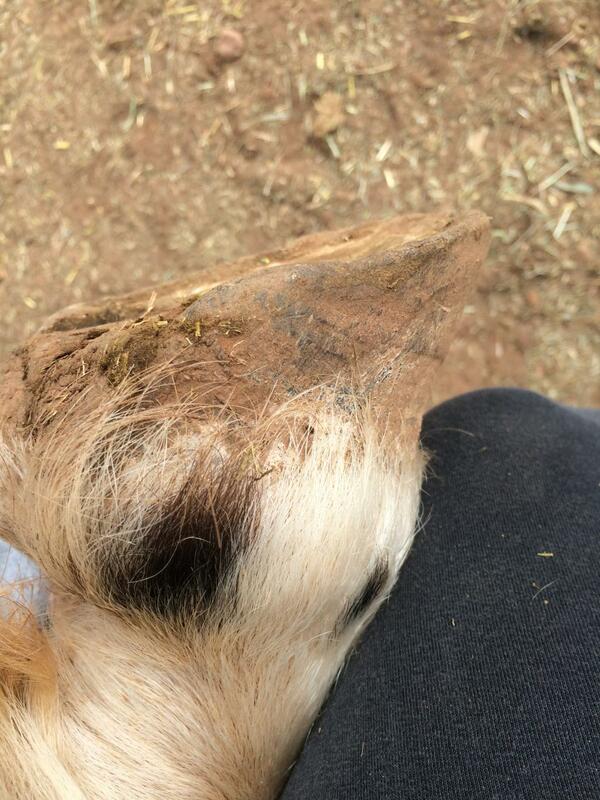 While this hoof is being rehabbed from founder, I did want to point out irregularities in the new growth as an example of what you might try to change on the solar level to help compensate for. In this case (aside from everything else the hoof is going through, oh dear!) look at the hairline and note that as it wraps around to the right side of the image, it's pushed UP quite high. That would indicate, in a very simplistic reading, that the hoof had too much support "under" that pushed up portion, i.e.. the quarters were actually too long. If you mentally pushed that hair line down with your thumb and let the hoof magically "slide down" you would have about an inch long "bulge" on the solar plane. 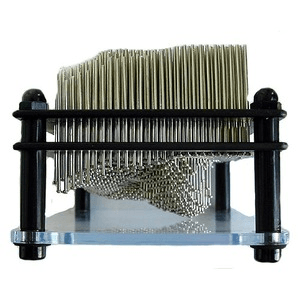 Maybe a better example would be this: remember those pin toys, you press one side and the pins push through? 2) Resist from the bottom and push BACK UP. You get to read all of it before deciding what to do with the trim. And here is the RIGHT FRONT. We will see the "outside" heel growing longer and flaring out a bit more than the inside one. 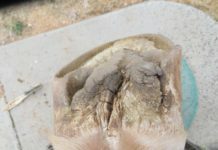 We see a lot of hoof wall to trim off and we can still see the false sole as it is flakey, powdery and you can't even see the "seam" of connection between the hoof wall and the sole. 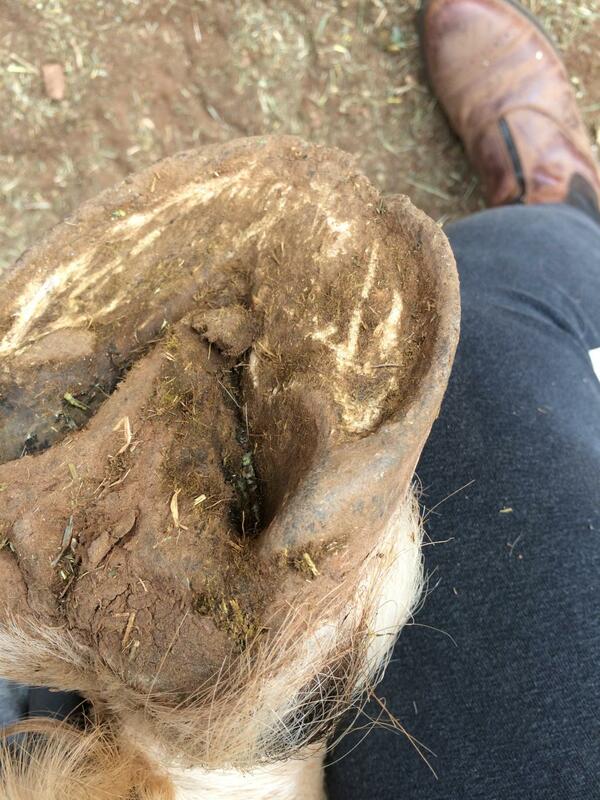 Close up so you can see the powdery texture of the sole and the hoof wall width and depth. Again, she won't have a mustang hoof on soft ground like she has. She will have long hoof wall that won't wear down and a soft sole that isn't being roughed and shed/exfoliated by its contact with the ground. Just like our other front hoof, we can see the rings of dietary and exercise/environmental change growing out on her foot. We can also see increased heel growth that is outpacing the toe growth. You can see the white band of waxy periople of new growth since she's been here and the good sign is: there is a lot of it. Again, her heel is trying to grow long and forward, in an effort to support her leg column as she doesn't want to use user flaring toe to do so. Again, she has a taller heel and bar on the outside wall. 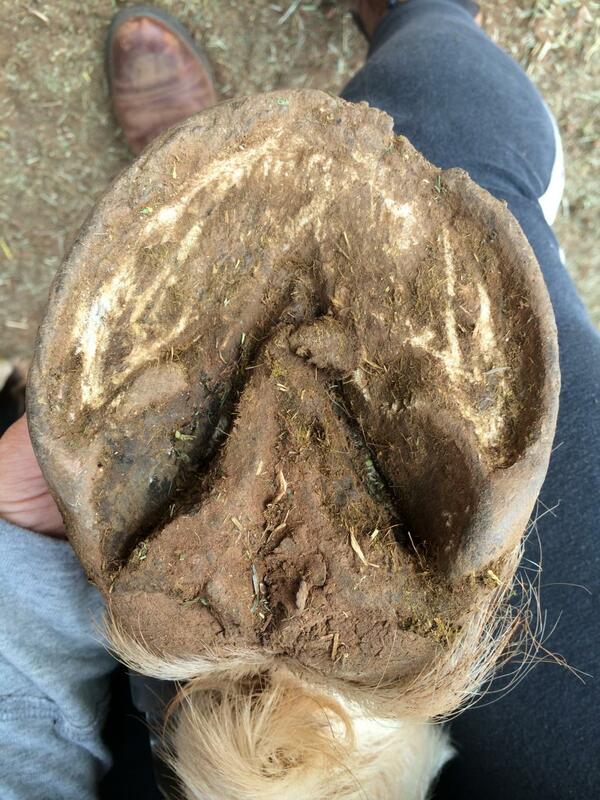 The inside heel is also quite tall, and will be trimmed down, but she had previously been shod lopsided. 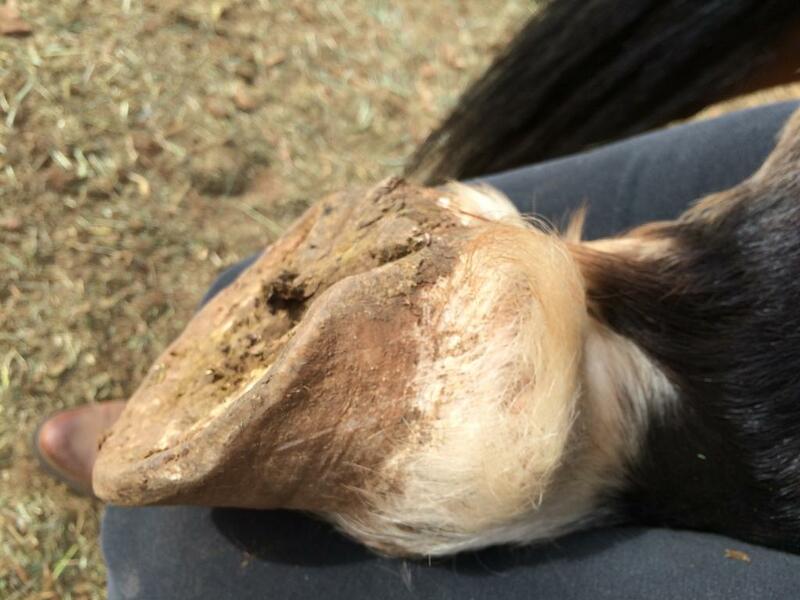 It's one thing to have a horse that crushes the inside wall of a particular hoof, but she has the lazy pattern of a person who rasps and nips heavy on one side and light on the other. Ironically (and I could be VERY wrong) I see the outside as the "easily accessible" side of the hoof. When you rasp or nip, you have free clearance. You have the room to make it level. As you rasp and nip on the inside, you can run into the horse's belly. Rasps angle down to get under the belly and everything that goes towards the inside gets more taken off. She doesn't travel in a hoof path that would wear them this way. I will have to be mindful to really try and rasp correctly and prove if she's growing them this way, or if she wasn't trimmed properly. 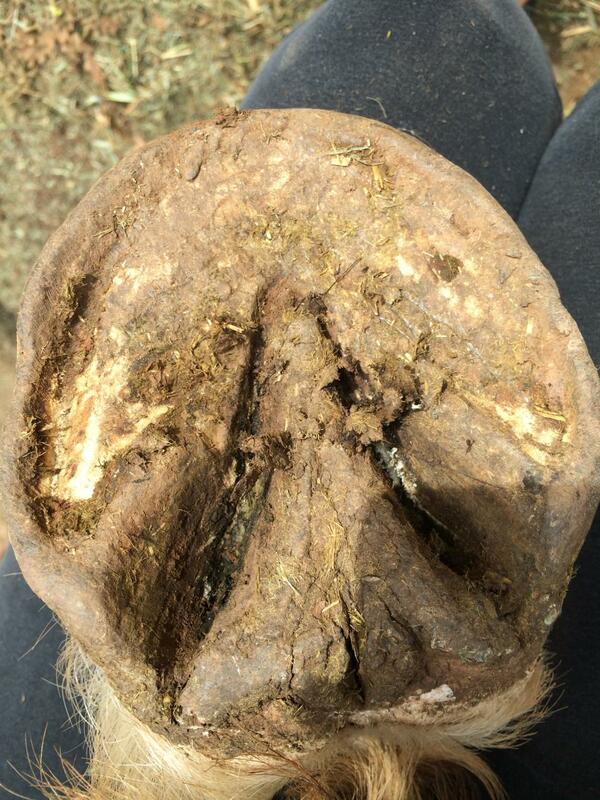 What I DO like about this hoof is that her hoof wall along the toe has cracked and split off. She agrees: my toes are too long and this stuff has to go! I like the way her new growth is coming in too. The heels are not growing AS fast and her toes are also not AS flared (for me, this is not a coincidence and these two markers go hand in hand). She also has the start of slight cupping. I will expect, after a bit more living here, that she WILL have cupping, as she has soft ground and constant sole pressure (albeit no abrasion as the texture of the ground is fluffy soft dirt and minimal rocks). If her hoof can cup, this would be the ground to do it. Horses that live on hard packed dirt, the equivalent of pavement, I wouldn't expect to get cupping. 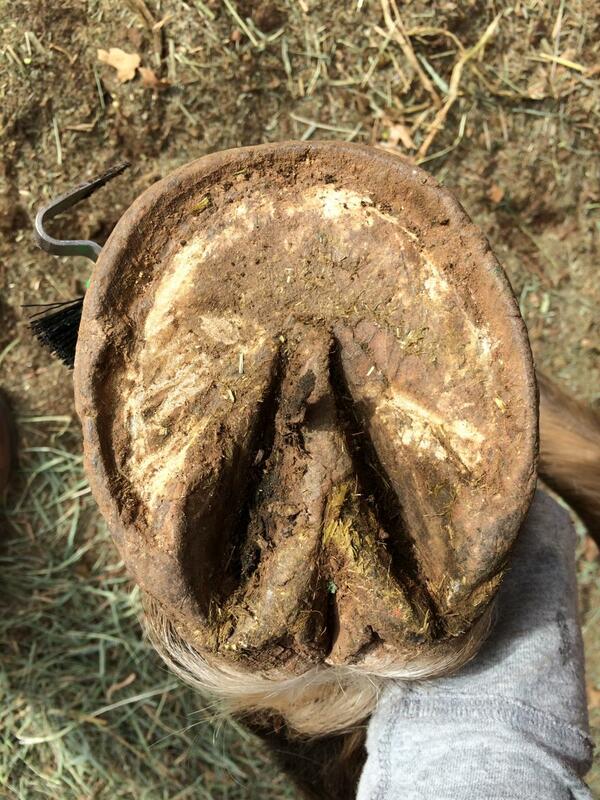 And again, I want to share this to dispel the concept that barefoot = a hoof shape, or barefoot = mustang hoof. It doesn't. Genetics does not equal hoof, nor does purely trim. Here is an angled shot of that same LEFT HIND so we can see the heel and how long that bar is. 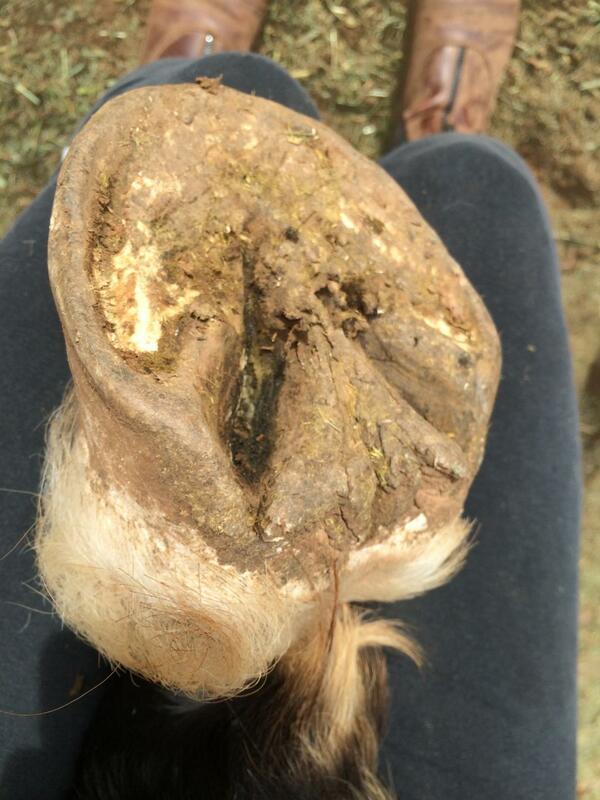 If I didn't read that the sole was false and powdery and fake, I might make the mistake of trimming the heels down and lightly nipping the hoof wall and visually "leveling" the bottom of the hoof. I might be sorely surprised when that sole does flake out that I wrongly hacked the heels off and left the toe quite long. You can't just read the sole. You can't just read the angle. Just like you can't only read the past and not look at the current growth. A hoof is 3D and you need to read it in 3D. 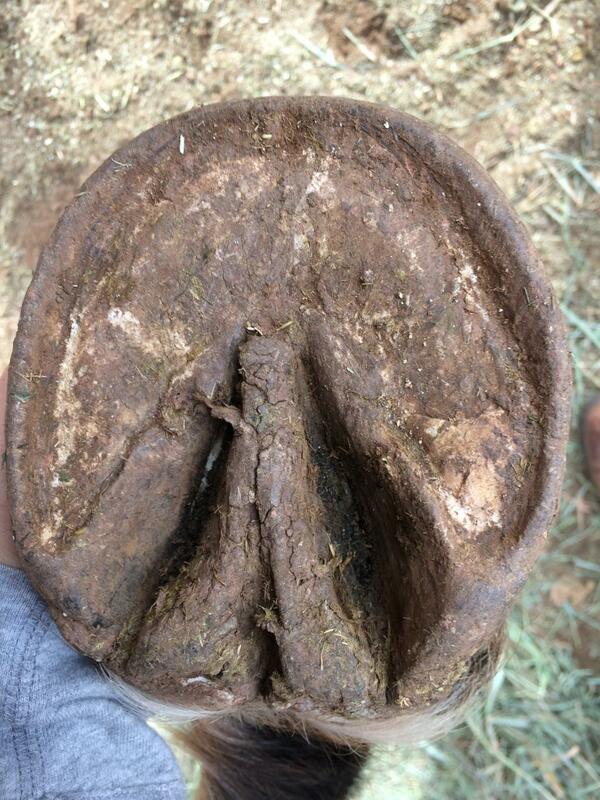 Again, this hoof might almost look "great" and like not much would happen with it. Those heels are "tall" and the bars are long, which might make one drop those down. While the bars look like "an inch" could come off (or more) the hoof wall looks like 1/4 to 1/2 an inch comes off. Here would be the problem of thinking that was the true sole: you get the wrong sense of length of the hoof wall. If I hacked off the heel more than the walls I likely would've wronged her. I would've created a longer toe and pressure there. Betcha next time I went to trim her, I would've found even more heel had grown back and had grown forward, to take weight off the long toe I created. Her hoof might not have MY past attached to it, but soon enough it will. She had her shoes pulled and her first trim to start her. She's now had trim number 2. Pretty soon, her uneven heels and long toes will either be gone, or something I have kept going by how I've trimmed her. I'll own that when the time comes. Now it starts to look ugly! Once we start to see it in 3D we get more of a story. UGH! Again, my first desire is to kill those heels. I see them scooping out to the sides in a flare, I see how long the bars are, I see where the frog plane is compared to the heels and bars and see how far they could drop to let the frog actually reach the ground. But, I can also see the tight band of growth coming in and the way the hoof wall has belled out and actually flared. 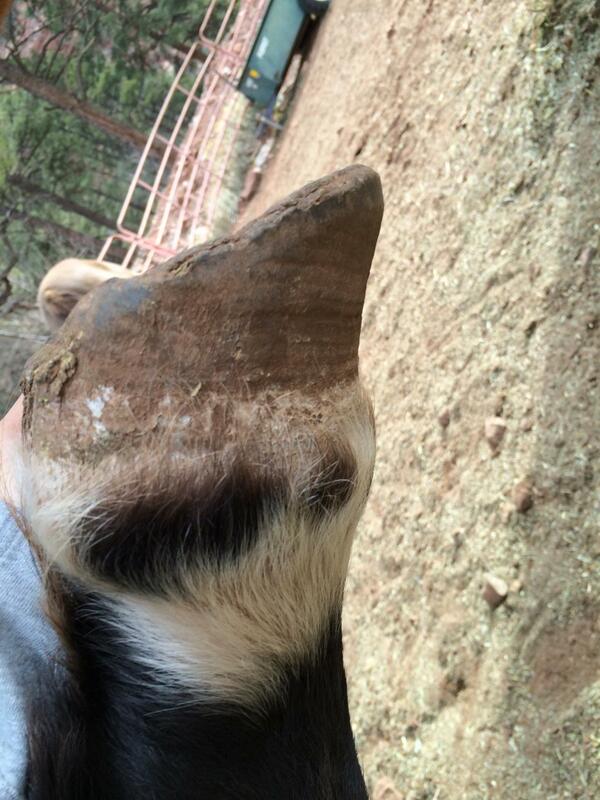 She still has a "long toe" on this hoof, as factually, the whole hoof wall is long and belled out. If I take off those heels, I have to commensurately take off those toes. I could be fooled by how tough and thick her hoof wall appears from the solar view. But it's not as thick as it seems. Part of it is the thickness, but it's coupled with a false "width" of where the hoof wall has folded over. In this little sketch you can see (from L to R) a hoof wall at X width. A hoof wall growing too long and curling or flaring outward. When it wears along the ground, it polishes off that little edge and you can no longer *easily* distinguish between the width that is hoof wall and the width that is the flare folded over. Hence, we read the hoof in 3D and don't simply look at the sole and say "My what lovely thick walls you have!" when we peek around the corner we see gnarly flares and have to rethink into, "My, what lovely thick slightly flared and folded outward hoof walls you have!" Again, the more 3D you can examine the hoof, the better full picture you are getting.Now we can see how the hoof wall is flared and folded outward. 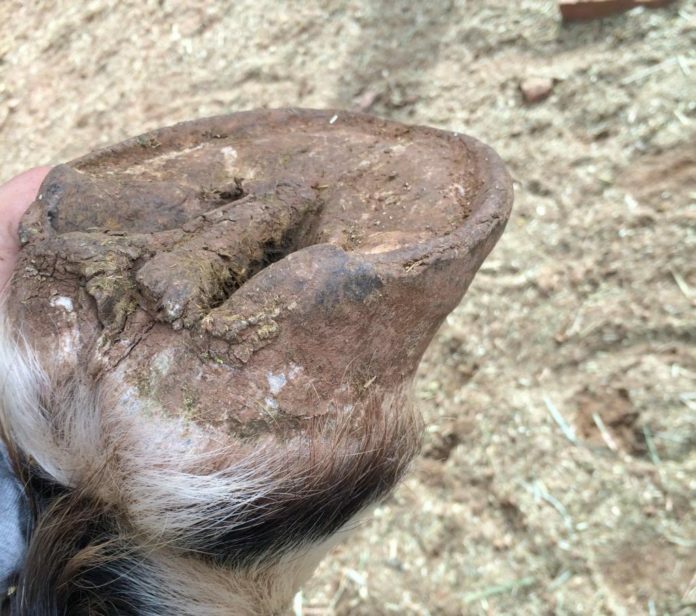 We can physically see the "edge" or flat surface of the hoof wall folded outward until it's almost at a 45 degree angle from the ground. She's not wearing the hoofWALL she's wearing the hoofCORNER. Again you can see the curly side of her hoofwall flare. I like taking pictures before and after trims and saving them. I like going back a few months at a time and seeing if I am creating a monster or curing a monster. I find I look back on photos and go, "I'd do THIS" and then I glance at all the angles I took of the hoof and then at the other hooves and go, "Huh… maybe not." I like seeing a "problem" crop up and then going back a couple of months of trims and going, "THERE, it was right THERE and I missed it." I don't trim a horse so aggressively that it will go lame, no sir. But I might trim too slow and so cautious that I am not steering the ship away from an iceberg fast enough. I gain confidence in what I am doing right by looking at my own before and afters and seeing if she moves better and is happier. Her mobility, soundness, desire to move (impulsion) and how the hoof is starting to grow in are my stars and compass to guide me. Anyone who handles hooves will tell you they are constantly learning. Every hoof of every horse is different and each of them teaches us to "read" until we are more fluent in Hoof. Stay tuned for the AFTER blog. 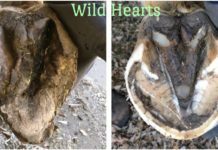 Through a lifetime of "horse crazy" and the fortunate experience of riding nearly every shape and size of horse, I got to see a wide array of hoof shapes and sizes. No Hoof, No Horse is very true to me. I want to ensure that horses on every continent have a variety of footwear to pick from, to ensure the best match is found. I want your partner to be happy from the ground up!